As babies begin to take their first steps and enter the toddler stage of development, they also grow out of their crib and need a more traditional bed. But, what is the best mattress for toddlers? I thoroughly researched the matter for my own kids, and hopefully, you can benefit from my labor! One of the first steps in choosing the best mattress for toddlers is deciding what size you need. Many parents think that a twin mattress is best since their child is so small. Yet, unlike clothing, this may not be the ideal choice. If you like to cuddle in bed with your toddler or to read bedtime stories to them, you should consider a full-size mattress if space allows for it. This can make these activities more comfortable. Another reason to think about a larger mattress is if your toddler’s room also serves as a guest room in a pinch. As your toddler gets older, she will want to have sleepovers and share a bed with her friends. The size of the box spring is another consideration you need to take into account. You can keep the overall height of the bed a bit lower if you consider a Bunkie or low profile board. You can always get a bigger box spring when they get older. It is important to think about what will be best for your child in the future since new mattresses can last for up to a decade. The best mattress for most people and by far the most popular option is the traditional innerspring mattress. On the other hand, water, memory foam, latex, and air mattresses are valued for their durability, longevity, and comfort. The problem with memory foam mattresses is that they may sometimes have an unpleasant odor when new and some are hard or too firm. Latex mattresses are durable and springier, but they can also be quite costly. Of course, this acronym needs to be reapplied to toddlers. You will have to do the trying out of the bed yourself. It is better to go with a firmer mattress for youngsters because this gives more support for growing bodies. However, it should not be so firm that it is like your child is sleeping on concrete! A firm innerspring mattress with a comfortable topper is a good middle ground. Choosing a good topper can be hard. There is debate about whether an all-inclusive mattress with a pillowtop is better than buying a topper separately. On the one hand, the pillowtop could wear out faster than the mattress. On the other hand, the structure of the mattress could change if you use a separate topper. I recommend going with the all-inclusive mattress. Then, if the pillowtop wears out, you should switch to a separate topper, such as a mattress pad. Of course, the benefit of a separate topper is that if a toddler thoroughly soils the topper, you do not need to replace the entire mattress. How Do You Judge the Quality of a Mattress? There are essentially three kinds of mattresses: high quality, midrange, and low quality. These are sold under different names in different stores by each mattress brand. For instance, Acme Sleeperton is the name of a fictitious mattress in one store, but the same mattress is called Acme Naptime in another. Consequently, do not be fooled by the many model names. Of course, there are models that are consistent wherever you go, but these are generally more expensive. The weight of a mattress is a good indicator of how good it is. Typically, better quality mattresses weigh more. Since toddlers do not weigh much but need adequate support, the most appropriate mattress is one of the midrange options. There are several other features you should consider when looking for the best mattress for toddlers. For example, you will want to find out if the mattress is waterproof, or at the very least, get a waterproof cover. Hypoallergenic mattresses are also usually important for children. Latex is considered good in this department. The chances are that if you have a little one, you have heard of Safety 1st. They are the makers of a broad range of products that keep youngsters safe. This is the ideal mattress for transitioning your baby into a toddler bed, and it is affordable. There are two different firmness levels depending on what side you have up. One side is geared toward babies, and the other is for toddlers with an additional cushioning layer for added comfort. This will last you beyond the toddler stage with its durable construction. This mattress has achieved Greenguard Gold Certification and meets federal flammability standards without using potentially harmful chemicals. The My First Mattress Premium Memory Foam Mattress is another mattress that transitions nicely from the baby crib to the toddler bed. It was designed to promote a restful and safe night’s sleep. It combines comfort with support. The My First Mattress meets a long list of safety standards as defined by the American Society for Testing and materials as well as the CPSC. It is made of CertiPUR-US certified flexible polyurethane foam as analyzed by an accredited, independent testing laboratory. There is the potential for these mattresses to smell a little bit when they first arrive, so I recommend letting it air out in a well-ventilated area, such as your garage. Sealy is one of the top names in the mattress industry and has been for over a century. This foam mattress is extra firm and designed to fit in a crib as well as a toddler bed. It is made of soybean oils supplied by American farmers. 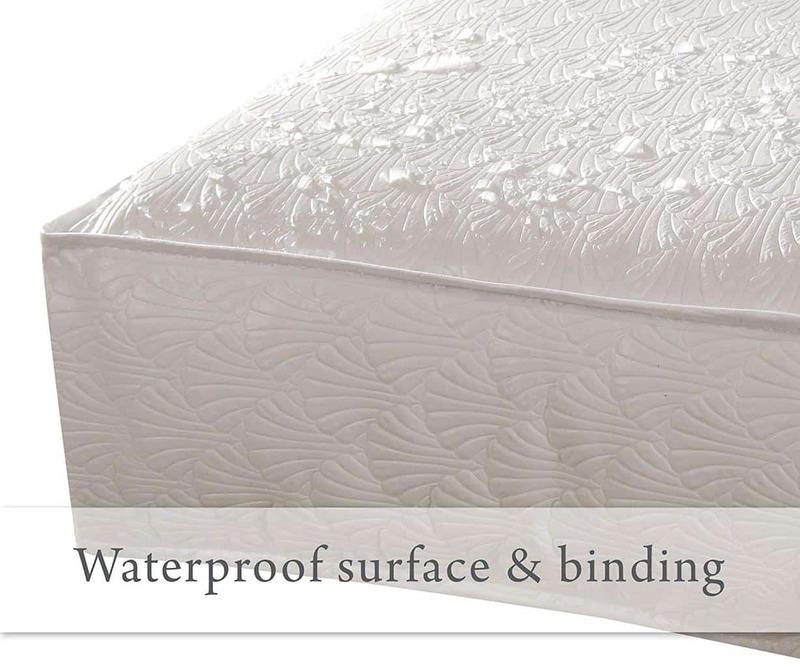 The Sealy Soybean Foam-Core Mattress has a stain-resistant and pearl-embossed waterproof cover for easy cleaning. To provide firm support for sleeping toddlers, the soy-based, high-density foams offer increased durability and reduced sagging. In addition, this mattress has won the America’s Best for Baby category at the Women’s Choice Awards for multiple years. I would recommend this mattress for parents who are concerned about having a “green” mattress that is made by a well-known manufacturer. This mattress is free of phthalates, vinyl, lead, PVC, and polyethylene free. It has a non-toxic waterproof, durable nylon cover, so if your toddler has an accident, it will be easy to clean up. The seams are side-stitched and the cover is hypoallergenic. This is another mattress that works great for infants and toddlers. The infant side features extra firm, high-density foam. As your child ages, simply flip the mattress over for the firm, high-density foam toddler side. The foam is CertiPUR certified. The Little Dreamer mattress from Moonlight Slumber is one of the safest in its class. I would recommend this to parents who are concerned with the safety of their soon to be toddler. The Dream on Me 3” Spring Coil mattress is a relatively new mattress that seeks to achieve a good balance of support and comfort. The interwoven steel coils are wrapped in polyurethane foam that is hypoallergenic. A waterproof cover protects the foam and features lock stitch venting. The Spring Coil mattress is resistant to mildew, odor, and mold, and you can use a mild soap and warm water to wipe it clean. It is phthalate and lead free and passes federal flammability standards. For parents who are looking for something that they can bring with them while traveling, this would be a good mattress choice. As you can see, there is a lot that goes into picking the best mattress for toddlers. There is no one mattress that is perfect for everyone. Consequently, it pays to do your research. I hope the above reviews and buyer’s guide can help you in your decision-making process.